High School - Where did you go to? I went to Polytechnic University of the Philippines Laboratory High School. Quite a bit of a mouthful, isn't it?lol! Its called PUPLHS for short, or LabHigh as it is commonly known among us who went there. Although we study in a big school, (we share the same campus with college students) the high school community is quite small, with less than 500 students all in all. So where did you go? Wouldn't it be fun to know that someone from the same school is also here in mylot?lol! I went to Our Lady of Grace Academy and Colegio de San Lorenzo here in manila, i transferred during my sophomore year because of the location, the 2nd school was nearer from where we used to live. However, i wish i just didnt, i was happier in OLGA rather than in CDSL- I do hope to see some old shoolmates here too. Camrin High School is my Alma Mater! I take my high school in Pedro E. Diaz High School in Alabang, Muntinlupa Philippines. Nice topic. God bless. Colegio de Sta Catalina de Sena, Biñan, Laguna. It is quite a mouthful too. I loved this school for its expansiveness, conduciveness for learning and I had a great deal of fond memories from my stay. We were the pioneers from a college school in Las Piñas, it was then as old when we first started our freshmen days. My Alma Mater is Bernardo College, in Pulan-lupa, Las Piñas City.. I went to Silliman University High School(SUHS),its part of Silliman UIniversity which is one of the best in teh Philippines as well as Asia.Its located in Duamguete City,Philippines.We will be having our 10 year reunion this year. 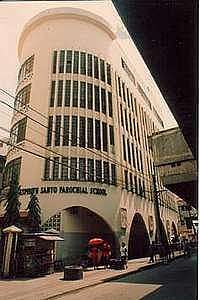 Mine was Espiritu Santo Parochial School or ESPS located somewhere at the corner of Rizal Avenue and Tayuman in Manila.